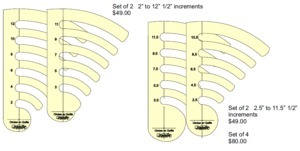 These templates allow you to quilt circles at 1/8" increments from 1" - 12". Can be used to make baptist fans. Using our single pin system, there is only 1 point of rotation, which reduces movement. For use with domestic machines when fitted with the Westalee Ruler Foot. Happy here! You have a great selection. It's my second purchase. With the first last year, the wrong thickness of rulers was sent even tho it was specified what I needed. It wasn't a slam dunk to get approval to send the first back, but to your credit, I got the correct rulers mailed with the envelope trusting me to send the first set back - which I did. So that all took awhile, but I have patience and all was correct in the end. I will continue to order. Looking at more templates!! Thank you.